There are 206. Though some might say 208 or 350, or even more and possibly less. It depends on what you read, and how argumentative you want to be! Why, in one of your wrists alone, there are eight: capitate, hamate, lunate, pisiform, scaphoid, trapezium, trapezoid and triquetrum. 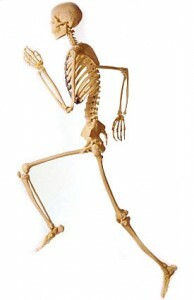 Bones, the solid infrastructure of our body! Once, in a hospice team meeting, as we reviewed a patient’s concerns, a nurse mentioned the ulna. “It’s a bone in the upper arm,” answered another nurse. The knee bone’s connected to the neck bone.